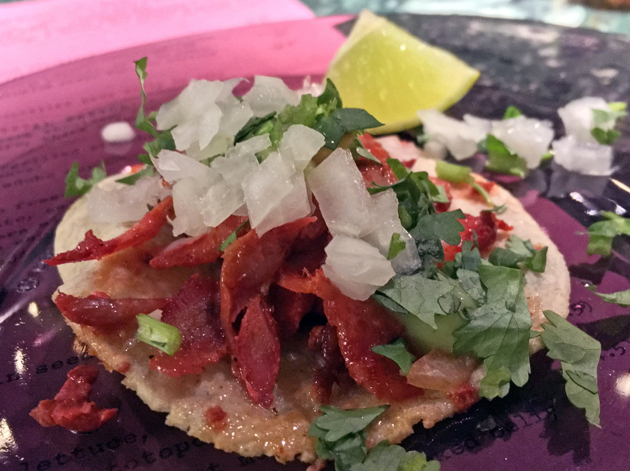 El Pastor review – the Barrafina of tacos? Not quite. Restaurant decor has fallen into a bit of a rut in recent years. From exposed brick walls and concrete floors to reclaimed furniture and brass fittings, it’s rare to be truly surprised by the interior of any London restaurant these days. While El Pastor, on the edge of Borough Market, doesn’t quite escape some of these interior design cliches, it’s still much more distinctive than most. Situated inside an old railway arch, El Pastor’s fusing of shipping container-style corrugated metal with curved brickwork is surprisingly elegant. Festoon string party lighting isn’t terribly original either, but it all feels quite coherent rather than a jumble of architectural and interior decor fads. There are some oddities and problems with the design of El Pastor’s interior though. I’m sceptical of the odd Jubilee line-style padded half-standing half-seated perches at the tables near the bar – especially given how sluggish the service can be. The lack of curved banquette seating in the corners means those tables can be a tight, uncomfortable squeeze – especially when the service inadvisedly insists on shimming a group of four into it, as it did on my second meal here, when it’s suited for no more than three. 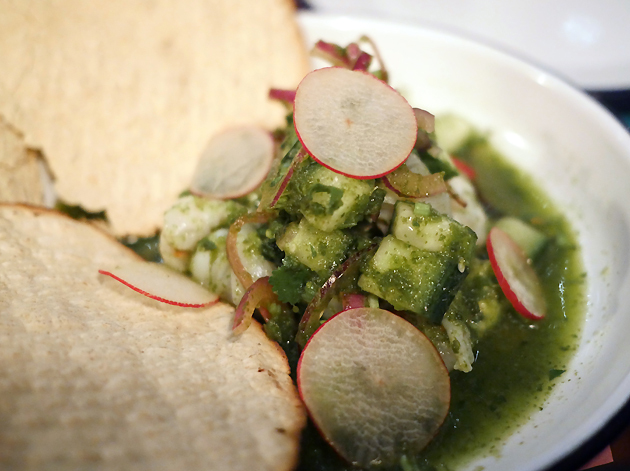 That aside, El Pastor is one of the new wave of Mexican restaurants in London following in the wake of Santo Remedio. As if the exemplary standards of that now-closed Shoreditch restaurant wasn’t a high enough bar, El Pastor is also the latest venture of the Hart brothers – the owners of the vaunted Barrafina and the current incarnation of Soho institution Quo Vadis. Expectations are tricky beasts; especially when they involve mastering the art of Mexican cuisine. Breddos Tacos, El Pastor’s Clerkenwell competition, has been slowly winning me over to tostadas which made the effort here all the more disappointing. 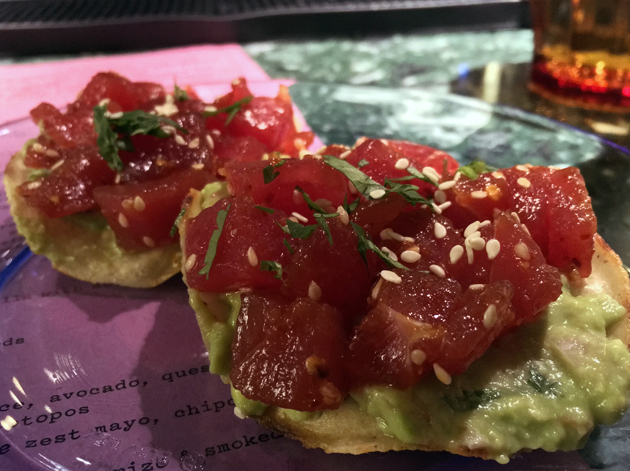 Raw tuna had a light umami and a delicately nutty sesame glaze, but this was easily overwhelmed, not by the creamy guacamole, but by the stodgy and hard fried tortilla base. The Borough Market location is almost a licence to print money. El Pastor gets its name from its signature dish, a pork taco that owes its doner-like origins to Mexico’s Lebanese immigrants. If you’re within sight of the open kitchen at the back, then you may catch a glimpse of the elephant leg of meat on the upright spit. 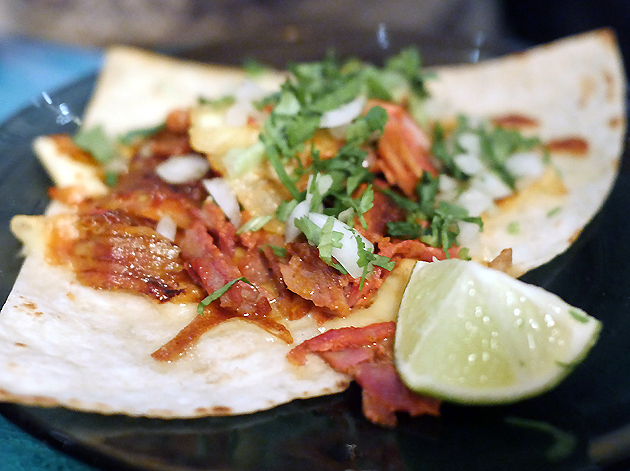 The corn tortillas, as with all the tacos at El Pastor, tasted tame, but were at least sturdy and reasonably fluffy. This was oddly fitting for the pork filling though, allowing its chorizo-like and chipotle-esque smoked chilli taste to shine through. This was conveyed on fleshy, moist and tender strands of pig. This utterly sensual delight wasn’t too rich, but the refreshingly crisp onions were nonetheless welcome and cut through the porkiness. Deceptively simple and excellent. 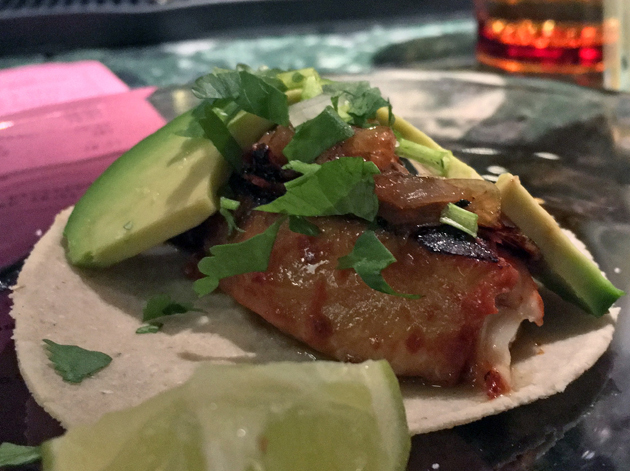 The pescetarian version of the Al Pastor taco was less successful, with sea bass substituting for swine. The moist and flaky bits of fish were fine, but this proved to be a less satisfyingly visceral conveyor for the Al Pastor-style rub which was itself surprisingly muted here. According to Snaggletooth, those padded half-standing half-seated perches inside Jubilee-line carriages are, in TfL-speak, the prosaically named ‘multi-purpose areas’. We’re not sure if the equivalent perches at Jubilee line stations have an official name or not. 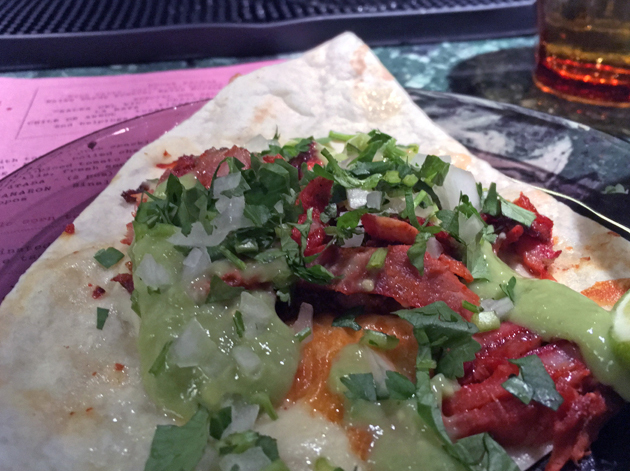 A far better alternate way of getting another Al Pastor fix was the gringa quesadilla. 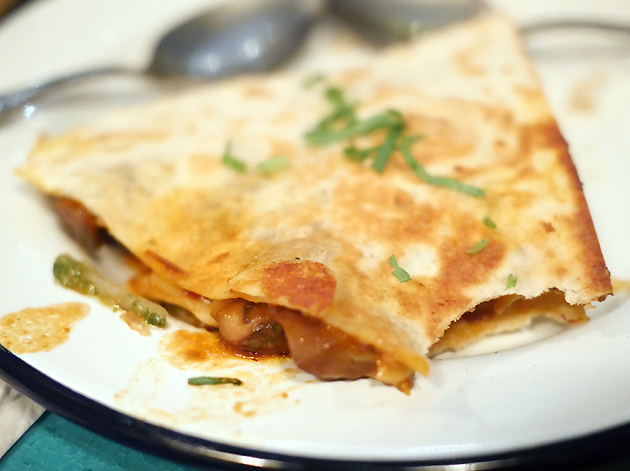 A big, smooth, sweet and wheat-based tortilla had the exceptional Al Pastor pork within its folds alongside a gooey dollop of melted Oaxacan-style cheese. The latter didn’t have the same level of saltiness as the Oaxacan cheese I had in Oaxaca City itself, but it still made for a fine quesadilla filling. The stools at the small bar are somewhat comfortable. 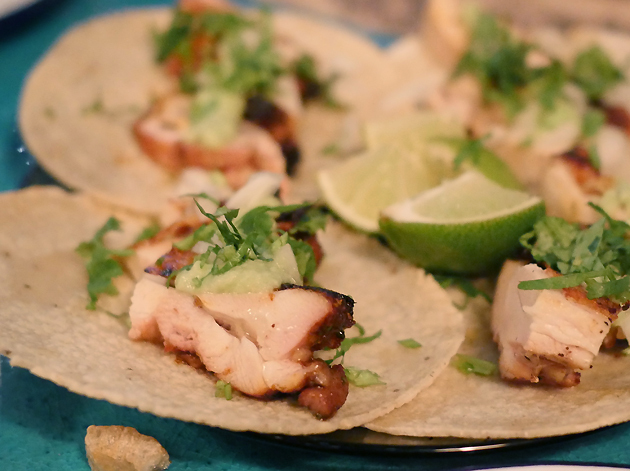 I wasn’t expecting much from the chicken tacos, which made the gently smoky and moreish rub on the chicken shreds all the more satisfying. The chicken itself had a lightly chewy and caramelised crust which sounds weird, but added some pleasing variation in texture that chicken usually lacks. Here’s the thing about opinions: they’re all wrong unless they’re mine. 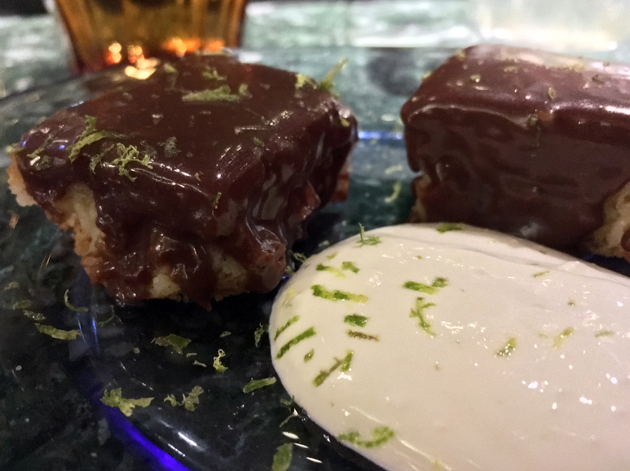 The ‘Bounty chocolate bar’ was more like a supermarket-level caramel square with the addition of desiccated coconut. Even the squirt of refreshing sour cream couldn’t hide the mundanity of a dish that you could rustle up yourself from left-overs in the middle of the night when you develop a case of the munchies. Note to pedants about the last caption: it was a joke. The Jolly Giant, Pikmin and The Lensman helped me sample a wider swathe of the menu for my second and final visit to El Pastor, putting up with the cramped corner table (as detailed above) with more good humour than the squeezed situation deserved. 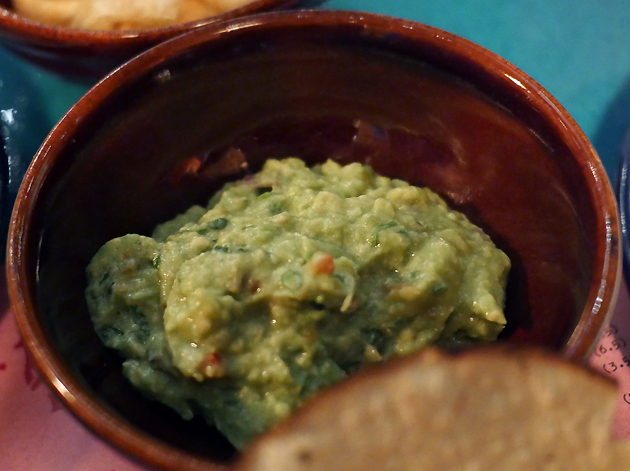 Chunky, creamy and lightly zesty guacamole distracted us from the enforced platonic knee nuzzling, although the crispy pork scratchings used for scooping were so inconsequentially light that they were more like vaguely pig-flavoured Quavers. Try not to get too much of it in your beards. I’m pretty sure I ate these last year at the office Christmas party. The tame aguachile dressing in the prawn ceviche allowed the firm and lightly springy prawns to stand out, a tactic that would’ve worked even better if the prawns themselves had a little more zingy fresh pep to them. All of this was understated enough to make the nutty and crisp totopos, a sort of toasted tortilla from Oaxaca, the best thing on this plate. The radishes look nice, but I don’t remember them at all. I must’ve had a radish blackout. 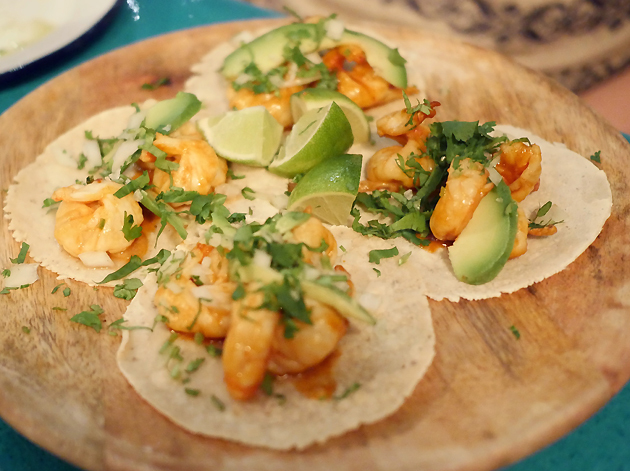 Prawn tacos proved to be a more convincing prawn dish, due in large part to the garlicky, zesty sauce. The tortillas were thicker, fluffier, nuttier and a tad bigger than before, but no less sturdy compared to the ones from my first meal at El Pastor. The moment where I curse myself for not adjusting my camera settings a little more. 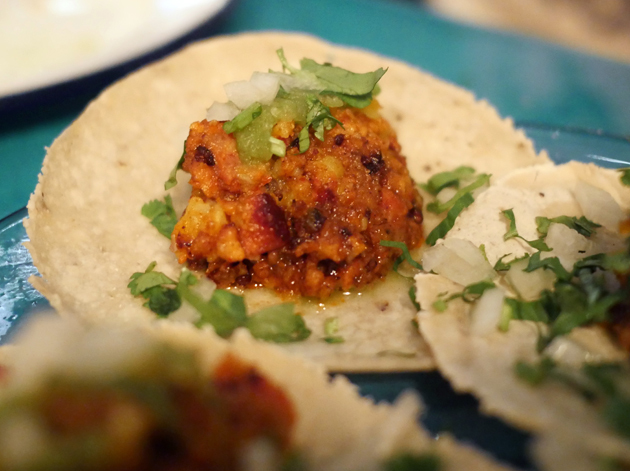 Chorizo and potato tacos were more starchy and sprightly than meaty. This, along with an odd texture akin to finely ground mince, made for an unmemorable bite. Objects in the photo are not as greasy as they appear in real life. The chicken tacos were just as good as they were before. 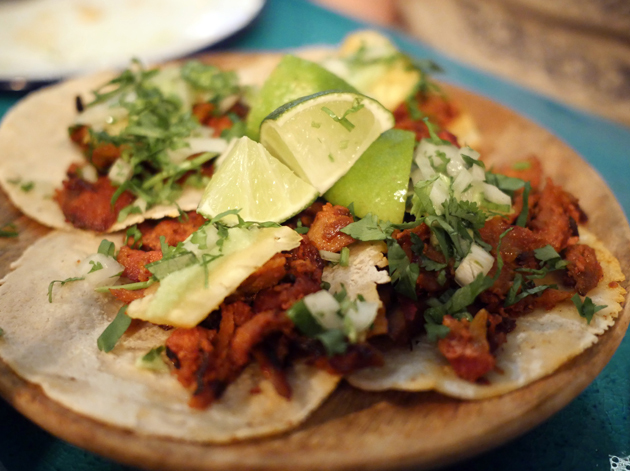 The signature Al Pastor tacos, on the other hand, had regressed. The chorizo-esque, chipotle-ish chilli smokiness was significantly more subdued – a mere ebb and flow, rather than the intense rush of before. While the pork was still moist and meaty, it wasn’t as outstandingly tender as it had been before. This level and type of inconsistency on a restaurant’s signature dish is a very worrying sign. If there’s a delay in the waiters taking your order, it’s probably because they have to continuously turn their router off and back on again before their iPads will work. Confit pork tacos were far more satisfying. The meat is served in a pot with the tortillas and garnishes on the side – you assemble each taco yourself. 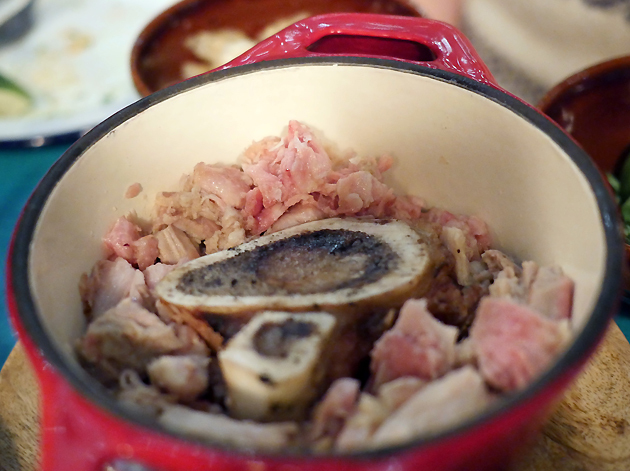 The unctuously moist, tender and fatty qualities of the pork were emphasised by the quivering and equally rich bone marrow – a garnish which, quite inexplicably given how essential it turned out to be, is an optional extra. 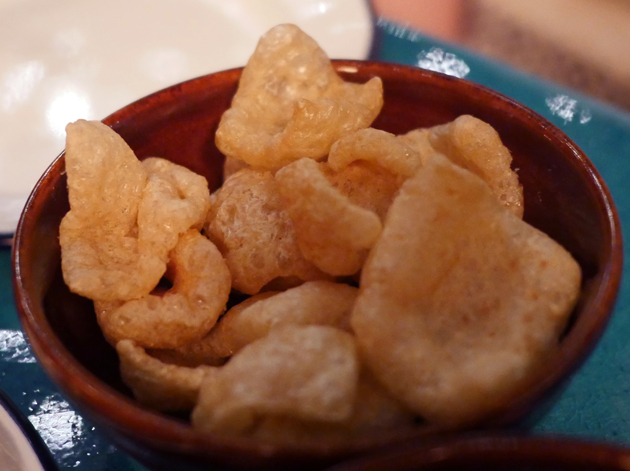 Small pork scratching crumbs was the best of the garnishes. Not because it added any extra porkiness (which it didn’t and none was needed anyway), but because it provided a neat contrast in texture between dry crispness on the one hand and tender fleshiness and gelatinous wobble on the other. It was, in other words, a success even if I did find myself looking back longingly at the Al Pastor tacos from my first meal. The smallest pot size is for two, although I reckon I could’ve polished it off solo. Given the dip in quality of the Al Pastor pork, it was no surprise that the gringa quesadilla wasn’t as satisfying as before. The Al Pastor pork was a tad more moist and unctuous than it was in the tacos, but it was still not a patch on its first incarnation. The melted, gooey Oaxaca-style cheese was a bit saltier too, but it was still a tame effort compared to the addictively stringy goo I tried in Oaxaca City. If ‘El Pastor’ literally translates as ‘The Shepherd’, then who/where is the sheep? Oddly, the roast squash quesadilla was off with a mushroom substitute taking its place. The supple and tart mushrooms were joined by the same Oaxacan-style cheese from the gringa, but the attention-grabber here was the dollop of sharp, sour and tangy sauce served on the side. Probably a tamarind sauce of some kind, it tasted somewhat similar to Japanese umeboshi (pickled apricot) and just as much of an acquired taste. Given the relatively timid cheese in the quesadilla itself, more of the sauce, as well as a more potent version of it, would’ve been welcome. My dining companions passed on dessert, leaving me to sample the pineapple with chilli and mint alone. The surprisingly generous helping of pineapple was sweet with a subdued sharpness and a hint of mint. 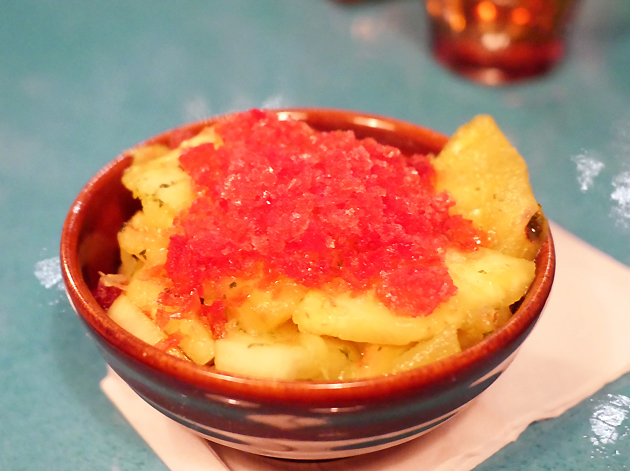 The latter, combined with a gentle tickle of chilli in the crushed granita spooned on top of the pineapple, made for a dessert that was refreshingly cool without being overly brisk or bracing. It’d be great in a sweltering London summer, but felt a little out of place in the depths of winter. I couldn’t help but hanker after a heartier tres leches cake or churros. Or perhaps even some tart and musky fruit from the Yucatan. One can dream. Distinctive architecture specific to its address aside, El Pastor feels like a template for a potential chain or mini-chain. From the branded tee-wearing, iPad-wielding staff and the odd seating to the short, easy to understand and undemanding menu full of dishes that are largely straightforward to replicate at scale, El Pastor feels like more than just a solo destination restaurant. This wouldn’t be a surprise from the minds behind Barrafina, but I could be wrong. In any case, El Pastor is already better than many of the other Mexican restaurants in town which is enough by itself to squeak in a Four Star rating. 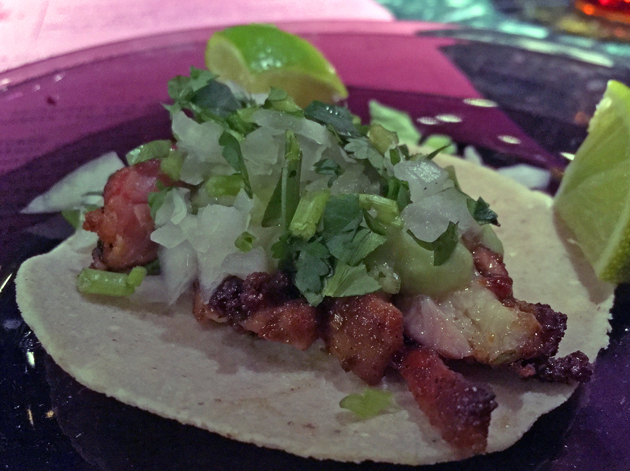 More work is still needed though – some dishes need a little refinement and the dramatic wobble in the consistency of the signature Al Pastor pork is deeply concerning. Overall, it’s not a patch on Breddos Tacos which is simply better from the ambition of its menu to the level of its culinary execution and flair. Still, more competition is good and if El Pastor doesn’t up its game in the face of it then I’d be very surprised indeed. Opening Hours: Monday-Saturday noon-15.00 and 18.00-23.00; closed Sunday. Average cost for one person including soft drinks: £30-37 approx. Tags: al pastor, barrafina, ceviche, chicken, el pastor, guacamole, london, pineapple, pork, prawns, quesadilla, restaurant, review, taco, tostada. Bookmark the permalink.